Arriving Cebu in June after 9 continuous months of backpacking Southeast Asia, I've returned to a place I keep coming back to - no matter if I thought I have seen the last of it after my last departure. I'd been here 5 months now. Cebu is special. Like Bangkok, Saigon, and Cambodia, it's a destination I will keep returning to. I am full of eager anticipation to what it offers next time around. With my deepening friendship with Jeanne, I find home at the Dragonfly Yoga Studio. It remains a privilege I am grateful for - specially with Jeanne's remark, "You are my house guest for life". That is both sweet and touching. She's not one to rave and banner-up the good she's done - and she's done a lot of good to a lot of people. I'm sure that even without my knowing it, she's behind some of the wonderful things that "spontaneously" happen my way. Some people are lucky because they win the lottery. Me? I'm lucky to be enjoying her friendship. I wonder what I have done to deserve such kindness. A place is made colorful by the special people you cross paths with. Metz has been the surprise curve-ball that came my way. From a passing acquaintance, we have developed a comfort level with one another. As fiercely independent as we both are, we seem to complement each other like two sides of one coin (or so I would like to think). We're not yet into finishing each other's sentence, but I can take refuge in her orbit. Together, we discover places, events and things happening in and around Cebu. Of course, we also discover a lot about ourselves in the process. Let's just say with her around, Cebu gets to be more colorful. But just like everything else, this getting-to-know-you is a continuous work-in-progress. Cebu is a place where I deepen my yoga practice. I didn't know anyone when I first arrived here. 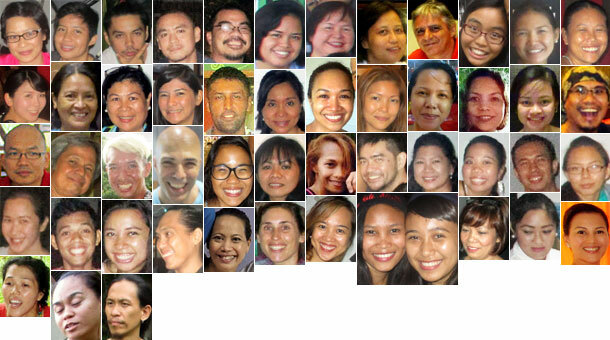 But thanks to Jeanne and the strings she pulled for me, I met the yogis and yoginis within Cebu's yoga community. Through my repeat visits to Cebu, I have sojourned into teaching at various yoga studios, gyms and centers. Now, I keep Studio 108 as a mainstay with occasional guest-teaching at Love Yoga World and Asana + Movement. My yoga evolves, and so does my teaching. It has now become an amalgamation of yogic tradition, life experience and transformation - not exactly the beaten path most studios offer. It's conservative to say that my brand of yoga is not for everyone. Students should find the teacher they can resonate with - it doesn't have to be me. I haven't had a kitchen since I chose to be homeless 5 years ago. With my stay in Cebu now, using Jeanne's kitchen, I seem to dabble back into my culinary pursuits - making homemade peanut butter using better ingredients (eg. using Anchor Butter instead of cheap cooking oil, honey instead of sugar, etc. ), granola energy bars, barbeque sauce mix, crepe or french toast for breakfast, or even the Swiss Rosti with smoked salmon. Some of them have come out so good, I even got commissioned to make them in batches. As a cyber-monk, I blaze the trail with my laptop as my ammunition of choice. In the kitchen however, I come equipped with my spatula, whisk and grater. Unlike most of my travels where I hover just above the poverty level (still, by choice), Cebu offers abundance to a point money comes in to fill-in the gaps created by increased expenditure - in fine cafes, trendy restaurants and glitzy events. I remember in Vientiane, Laos, I salivated over roasted duck I could not afford - not even on a side-street. Here in Cebu, I remain amazed that I end up savoring privileged food in fine restaurants with well-heeled folks and wash it down with fine wine. I find myself participating in engaging events and meeting interestingly animated people along the way. For a guy with no money or connections, how is that even possible? But it happens...more frequently than what coincidental odds might dictate. Again, I feel the presence of this unseen hand that has always looked after my well-being, of course, as what Joe Cocker would say, "with a little help from my firends". It's good for me to think I'm on borrowed time in Cebu. This gives me a sense of urgency to do whatever I came here to accomplish. Honestly, I don't even know what it is, but I try to clear my table in the most expeditious way to make room for new possibilities. As I connect these dots, the big picture will. at some point, reveal itself. In the meantime, I remain thankful for all the benevolence of Cebu and from the kindness of the wonderful people she keeps.